I can only sigh in agreement when I read this and YA! 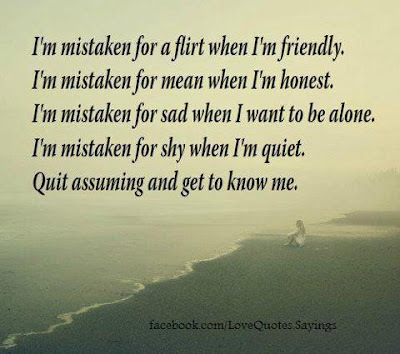 Quit assuming and get to know me! So for the fun of it let's do a list of the kind of people who peeve me. From bargains to great deals, from kid's milestones to academic results, you never fail to compare yours with others' even when no one asks for your opinion. And you just have to be the one that has the best deals and your kids are always better in every ways then your friend's kids. In a discussion or an argument, you just got to have the last say even when others have kept quiet or have apologised. When others have queries you are the usually the 1st one to jump out to give pointers and advises, this is commendable. However, some of them may not be applicable but you can talk and persuade others that it is the right solution. You are fast to seek others for help or favours, even for the littlest thing. When others asks a favour from you, though you agree to help eagerly you are quick to make it known to them on the trouble this person have brought upon you even if its something that is insignificant, you never fail to blow it up in exaggeration. Heard of the term "You scratch my back and I'll scratch yours"? You voiced out your views about certain issue, put your foot down to show how strongly you stand by your view to the extend of even arguing with others about it. When you see more are standing at the opposite of the fence, you suddenly change your view and join the crowd. *Note - The above list applies to both gender. At the end of the day, I am glad that I have my crazy friends whom I can rant to when I feel vexed when ever I have a bad day with some not so nice people. Disclaimer - The characters in this post are purely for some fun and harmless entertainment. Any resemblance to persons living or dead is purely coincidental.